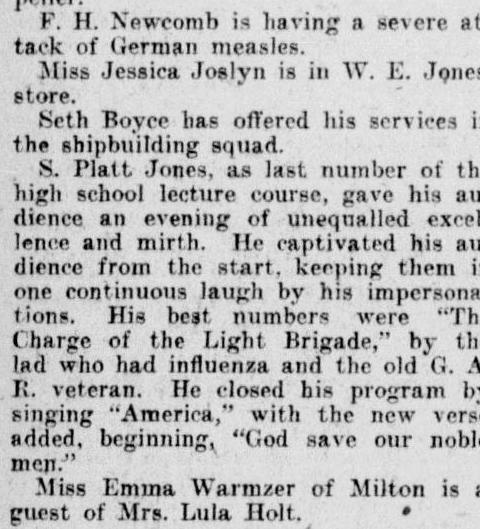 While Mr Newcomb is reported suffering from German measles in the Barre Daily Times social pages, a humorous entertainment is being held where "The Charge of the Light Brigade" is performed by a lad with influenza. On the front pages a third case of smallpox is reported, and a thirty years sentence for a sergeant at Fort Devens for "unpatriotic utterances." Source: "Social News," The Barre Daily Times, Barre, Vermont, March 5, 1918. Page 6, Column 1.